There is an embarrassing polarization of opinions about the status of economics as an academic discipline, as reflected in epithets such as the Dismal Science and the Queen of the Social Sciences. 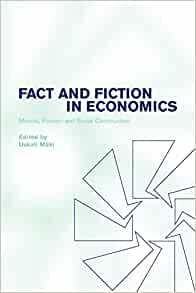 This collection brings together some of the leading figures in the methodology and philosophy of economics to provide a thoughtful and balanced overview of the current state of debate about the nature and limits of economic knowledge. Authors with partly rival and partly complementary perspectives examine how abstract models work and how they might connect with the real world, they look at the special nature of the facts about the economy, and they direct attention towards the academic institutions themselves and how they shape economic research. These issues are thus analysed from the point of view of methodology, semantics, ontology, rhetoric, sociology, and economics of science. USKALI MÄKI is Professor at Erasmus University of Rotterdam and Academic Director of the Erasmus Institute for Philosophy and Economics. U Maki,the editor of this volume of collected essays,has included far too many essays which are long on fiction and very short on the facts.Two of the essays essentially provide fictional accounts of what John Maynard Keynes accomplished in the General Theory(GT).These essays are essay number 3,written by P. Dasgupta and essay number 8,written by M.Morgan.On pp.74-76,the reader is informed that Keynes had no mathematical model that analyzed the role played by involuntary unemployment in his theory of effective demand.On pp.187-195,which covers section 3,titled"Modeling Keynes's General Theory",the reader is told that Keynes had no model of his general theory in the GT.Morgan starts out as if she intends to cover Meade's 1937 model which is in fact very similar to the model presented by Keynes in chapters 10,20 and 21 of the GT,the major differences being (1)that Keynes did not include a variable to represent interest rates and (2)that Keynes incorporates expectational effects by shifting curves while Meade incorporates expectational effects by changing the elasticity(shapes) of the curves themselves.Meade's paper derives results which are very close to the results derived by Keynes,i.e.,an unemployment equilibrium representing the amount of involuntary unemployment qualitatively in a formal mathematical model.Keynes's comment on Meade's paper was that there was nothing with which he disagreed.Morgan NEVER attempts to analyze either Meade's model or Meade's results.Instead,she starts talking about the basic assumptions of Meade's model,which are the standard assumptions of the perfect/pure competition model.Meade left out the word "pure" and wrote "perfect" only.However,this is of no major consequence as far as the mathematical modeling of either Keynes or Meade was concerned.The results of Morgan's paper are incoherent.There is a very simple way ,for either P.Dasgupta or M.Morgan ,to obtain the original mathematical model of the general theory presented by Keynes in the GT.The reader of the GT needs to be able to integrate(take the antiderivative of) the derivatives that Keynes presented in his formal analysis on pp.55-56,ft.2,pp.280-286,pp.304-306 and pp.271-278.These last mentioned pages refer to Keynes 's explicit discussion of the mathematical differences that existed between his model and the mathematical model of A.C. Pigou,presented in chapters 8-10 of PartII of The Theory of Unemployment(1933).To understand this comparison-contrast,the reader would have had to have already covered these chapters from Pigou's book.The following results can be easily duplicated by any reader or economist who understands differentiation and integration.Keynes's model consists of three functions.The expected aggregate demand function is D =D1+D2=f(N)=pO,where p is an expected price level and O,real output, is a function of N.The expected aggregate supply function is Z= Z1+Z2=g(N)=P+wN,where P is the expected profit,w is the money wage and N represents aggregate employment.The actual or current aggregate demand function is Y =Y(N)=C+I=PO,where C=bY (or C= a+bY)and P denotes the actual price level. (See p.209 of the GT).Solving this system of equations on the assumption that Say's Law holds yields the following solution:w/p= MPL/(MPC +MPI),where MPL equals the marginal product of labor,MPC equals tne marginal propensity to spend on consumption goods,C,and MPI equals the marginal propensity to spend on investment goods,I.The special classical and neoclassical theories(monetarism,supply side,rational expectations,real business cycle,etc. )all require that MPC+MPI=1.This gives the special result that w/p=MPL,where w/p equals the real wage.This condition,which represents the optimality condition for labor market clearing(NO INVOLUNTARY UNEMPLOYMENT)in all classical and neoclassical theories, is identical to the statement thar the macroeconomy is operating on the boundaries of BOTH the dynamic and the static production possibilities frontiers(PPF's).The reader should note that Keynes's general theory of employment is easily generalized to include a government sector,import sector,and export sector.Letting MPG,MPE,and MPM represent the marginal propensities for government spending(public goods),exports,and imports,we obtain w/p=MPL/(MPC+MPI+MPG+MPE-MPM).